Parcel-delivery services expect to deliver a record number of parcels this holiday season as Amazon.com and other e-commerce players are busier than ever. And so far, an expert says, the carriers have done good job despite a surge in activity. Parcel-delivery services expect to deliver a record number of packages this holiday season as Amazon.com and other e-commerce players are busier than ever. And so far, an expert says, the carriers have done good job despite a surge in activity. FedEx, UPS and the U.S. Postal Service delivered about 698 million parcels on time between Dec. 1 and Dec. 17, according to Satish Jindel, president of ShipMatrix, a shipping consultancy. That’s 96 percent of all packages shipped during that period, about the same performance as last year, despite a 12 percent increase in shipments. It’s a sign that the wheels haven’t come off the logistics industry even though more people shop online. The numbers also show how the monumental task ahead for those in charge of hauling those cardboard boxes in the run-up to both Christmas and Hanukkah. To date, “with the exception of several local weather issues, our service levels have been outstanding,” even though Christmas falling on a Sunday this year “has created anomalies” in shipping patterns, FedEx CEO Frederick Smith told analysts in an earnings call Tuesday. UPS said the “vast majority” of customers are getting packages on time, and performance is “running in line” with its plans. The carrier anticipates delivering more than 30 million packages each day this week. 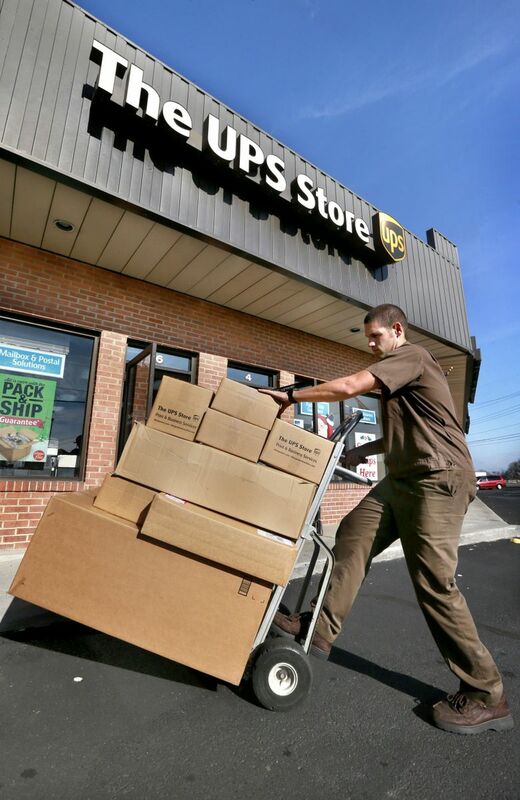 The busiest tracking day will be on Wednesday, when UPS will field 204 million online tracking requests. During a shareholder call in October, executive Kathleen Gutmann said that between Thanksgiving and New Year’s Eve, the company expected to deliver 700 million packages, nearly 17 percent more packages worldwide than last year. To deal with the deluge of orders, UPS said it was hiring 95,000 temporary staffers, rolling out new dispatch technology, and opened new automated facilities in Chicago, L.A. and other cities. The U.S. Postal Service carries about 62 percent of Amazon’s parcels, according to Jindel, the shipping consultant. A USPS spokeswoman said the agency expects “heavy package volumes this week,” with some 30 million packages being delivered on Thursday alone. Analysts expect Amazon to bring in about $44.7 billion in revenue for the holiday quarter, according to S&P Capital IQ. That’s 25 percent more than the same quarter last year. Last year, higher than expected demand made Amazon spend more money than it anticipated in dealing with full warehouses and rushing items to customers. This year the company has made massive investments in logistics, ranging from leasing airplanes to coaxing the merchants who use its platform not to store slow-selling merchandise in its warehouses during the holiday season. It’s also been on an unprecedented building rampage: The company added 18 warehouses just in the third quarter, versus 14 for the entire 2015. Amazon has had to deal with some hiccups at the start of the season, such as a brief pilot strike at one of the airfreight companies that operate the planes it leased.